How does Peltier technology work? The Peltier effect, named after Jean Peltier, is based on the recognition that a current flow applied to semiconductors arranged in a certain sequence generates a temperature gradient. A so-called Peltier module can therefore function as a heat pump by applying an electrical voltage. The reverse effect, after an electrical current flow is generated by using a temperature gradient, is called the Seebeck effect. What are the advantages of cooling with Peltier modules? What are the differences and similarities to conventional compressor systems? Both cooling systems have a heat flow from a cold reservoir to a warm one. In the compressor system, the heat transport is carried out by a cooling liquid, which is compressed by the compressor and transported through the system. In the Peltier cooler, the electrical current corresponds to the cooling liquid of the compressor, the DC voltage source to the compressor. Peltier devices are electrically adjustable. This achieves control accuracies that are not possible with compressor cooling. Peltier elements are easily reversible. By simply reversing the polarity of the DC voltage, heat can be generated where cold first developed and vice versa. Peltier coolers can operate in the most adverse environmental conditions. e.g. 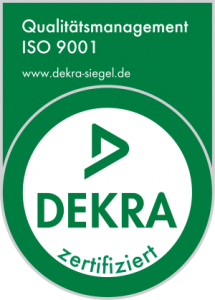 high ambient temperatures or heavily polluted ambient air, vibrations and strong accelerations are no problem. Peltier coolers can provide precisely defined small cooling capacities. The discovery of thermoelectric effects took place in the first half of the 19th century. Thomas Johann Seebeck observed the phenomenon named after him: If a closed conductor loop is formed from two different metallic conductors and there is a temperature difference between the two contact points of the two materials, a circular current flows in the conductor loop. Today’s thermocouples are demonstrative examples of this. Jean Charles Athanase Peltier discovered the opposite effect: under certain conditions, an electric current causes a temperature difference between two metallic conductors. In order to make the Peltier effect economically usable, today no longer two different metals are used for the construction of a Peltier element. The resulting temperature difference here is less than 1 K.
Rather, one metal is replaced by an n-doped semiconductor (the electrical conduction is by negatively charged electrons) and the other by a p-doped semiconductor (the electrical conduction is by positively charged holes). A copper bridge connects the two semiconductor legs. 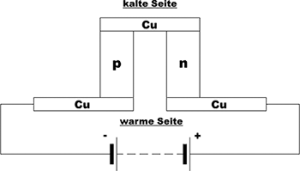 If direct current is sent through the Peltier element in the direction shown, the copper bridge connecting the two elements cools down. The two connecting bridges, also made of copper, heat up. In other words, there is a constant heat transfer from the upper copper bridge to the lower copper bridges. 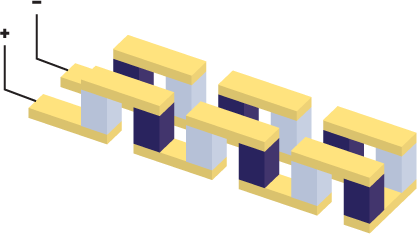 In order to obtain Peltier blocks suitable for the technical application, the individual Peltier elements are meandered together. The Peltier elements combined to form a Peltier block are thus electrically connected in series and thermally connected in parallel. The Peltier blocks can now be electrically connected in series or parallel if large cooling surfaces are required.